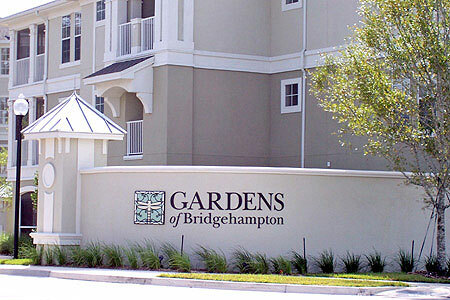 The Gardens of Bridgehampton condominiums in Jacksonville, Florida. Gardens of Bridgehampton is a new luxury condominium community located in popular Southside area with easy access to the Beaches, downtown, fine dining and entertainment. Recreational amenities include a clubhouse, coffee bar, business center, movie theater, resort-style pool complete with water fountains, fitness center, high-speed Internet and cable, auto-care center and conceirge trash service. See site map. This gated community offers one-, two- and three-bedroom veranda homes with 44 different design plans and a variety of upgrade packages. 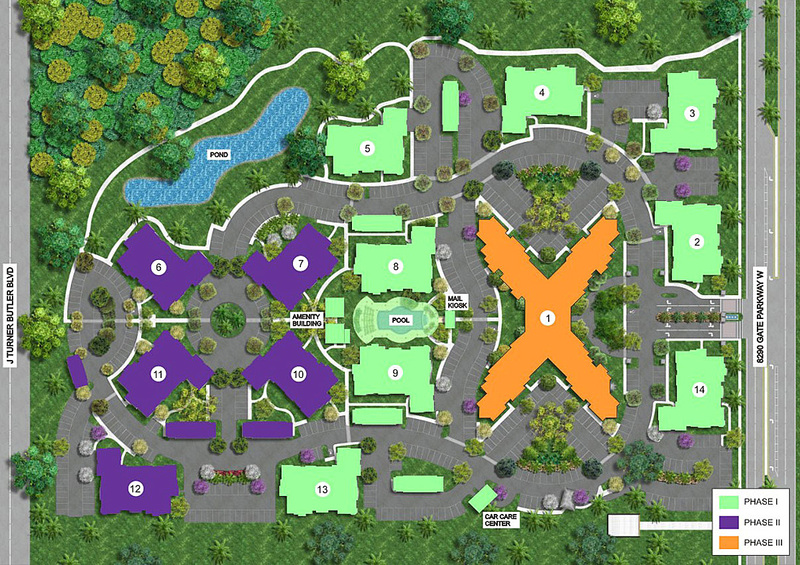 Choose from 10 floor plans ranging in size from 753 square feet to 1,551 square feet. Each unit includes a washer and dryer, screened-in porch or balcony ranging from 40 square feet to 200 square feet, walk-in closets, 9-foot ceilings, crown molding, oversize tubs and carpeting. Garage and storage area are available for purchase. Thirty-nine of the garages and storage rooms will have direct access to the condominiums, while there are six additional detached buildings that feature 40 garages and storage rooms. Experience life in the Grand Manor, the inspired concept of a wonderful community where people feel connected, not only to a place, but to each other. The Manor House will have 90 of the 352 homes in the community and be connected to a magnificent clubhouse, an example of "Old English Elegance Meets Chic." With a high ceiling, rough-hewn beams and a massive fireplace, this part of The Manor House will be a gathering point and social center for residents of the community. Community builder is Hudson Capital.